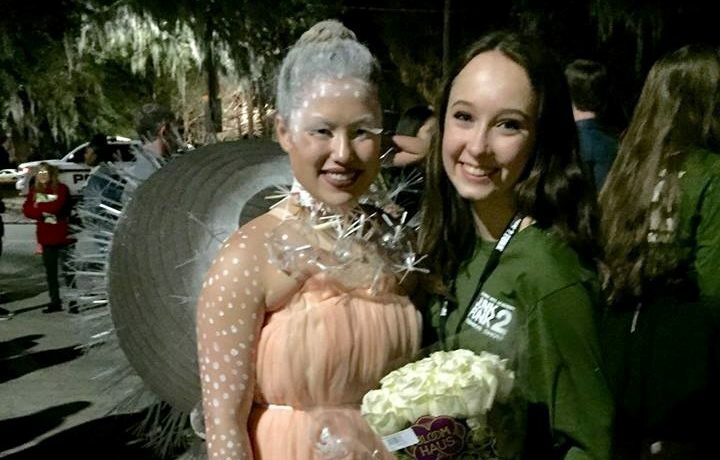 Junk2Funk: An Exchange Student’s Fashion Debut! My Name is Lola Dyson, and I am an exchange student from Germany. Here in the US, I am living in Savannah, Georgia. I live with my host mom and host sister. My host sister is in my grade too. I go the Savannah Arts Academy, a high school that is focused on art majors. The majors are dance, band, piano, theater, chorus, communications and visual arts. I am a visual arts major, and this includes me taking four art classes: sculpture, drawing, painting, and fashion. I was put into the visual arts department because even before I came here I was very interested in art, including fashion. I am going to attend an art school in Germany too, so I am lucky to be attending Savannah Arts. For 11 years, every year, there is a show called ‘Junk to funk’ (J2F). For the first two quarters, students in the fashion class are designers. This year there were over 60 designers including myself. This years theme was Botanical/Flourish. Every student had to choose a root, bloom, foliage, or succulent as their design concept. I had a simple flower called the dandelion. We then went into the designing process by studying our plant and developing ideas and sketches. Once we had our final design, the model auditions began. Over 100 students auditioned to be a model for the runway. As a designer, we choose our models carefully and hoped to get our number one choice. It is quite an event at our school, and everyone is a part of it. After taking measurements, we started collecting all sorts of materials, from straws to sponges. In J2F, we don’t just use normal fabrics but old junk and materials we could find all over school or our house. For my design, I used clear straws, fabric, a lantern, acrylic paint, and elastic band. It was very stressful getting everything done in time for the photo shoots, nut they were very exiting since it was the first time seeing my designs not just on paper but the actual garment in real life. I styled my model all by myself ; hair, makeup and body-painting was all a part of getting ready. The photo shoot was for a look-book that would be printed later and sold! In January, rehearsals started. A stage was built by students, and the lobby was designed by my sculpture class, so I helped with that too. Then the shows came around. Tickets sold out in less than seven minutes for all four shows! The opening night was a Thursday,and I still had to attend school even though we all had to get ready. The show started at 7:00 pm. This was the same for the Friday show too. On Saturday, I was in school all day. We had two shows. The Saturday night show was the most exciting one since, at the end, prizes would be handed out. The main prize was a scholarship. The garments are beautiful and crazy. My teacher’s motto was “The bigger the better.” The show is the school’s highlight of the year and a famous event here in Savannah. Even Will Smith saw last years show! Thanks to live streaming, my family in Germany was able to watch the show, including me on stage during the designer walk. It was a once in a lifetime experience that I will never forget. I learned a lot about stage presence, time management, and styling. I am so proud to call myself a Junk2Funk designer.